Calendar 2018 was a rough year for Chinese stocks as an economic slowdown coupled with trade war and FX headwinds created a flurry of problems that dampened investor sentiment. Consequently, investors sold in bunches and Chinese stocks dropped in a big way. Calendar 2019 is shaping up to be very different. 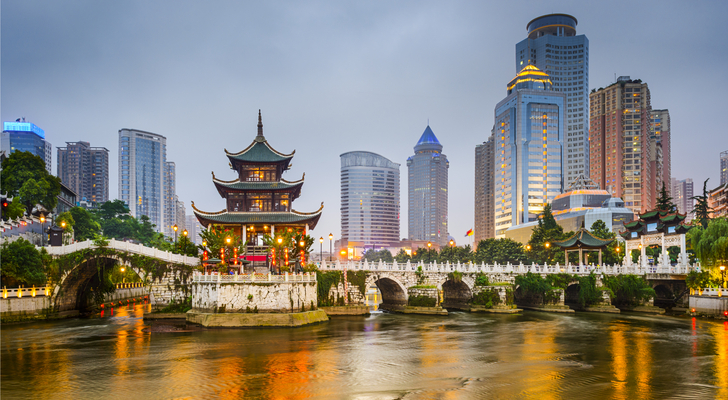 China’s economy is showing signs of stabilization. Consumer confidence has improved for four consecutive months and is at its highest level since February 2018. Production and business expectations are improving, too. January trade data was much better than expected, and factory activity contraction is becoming more narrow. Meanwhile, there’s a lot of optimism in the air regarding a U.S. and China trade resolution in the near future. The U.S. dollar has also significantly weakened against the Chinese yuan in 2019. Altogether, the new year has brought new life back into these stocks. Consequently, many severely beaten up Chinese stocks have rallied in a big way through the first two months of 2019. This rally is far from over. Through the rest of the year, Chinese stocks will continue to claw their way back as China’s economy stabilizes, and trade and FX headwinds retreat. As such, now is as good a time as any to buy into the China rally. The Near-Term Outlook: Shares of Chinese internet search giant Baidu (NASDAQ:BIDU) are more than 40% off their 2018 highs, with the forward earnings multiple also 40% below where it was in 2018 and at its lowest level in several years. Meanwhile, Baidu just reported a double-beat, fourth-quarter earnings report that included 20%-plus revenue growth. Thus, all you need for BIDU stock to rally in a big way from here is a positive catalyst out of China. A trade war resolution and/or continued improvements in Chinese economic data will inevitably provide that catalyst later in 2019, and BIDU stock will consequently rally in a sizable way. The Long-Term Outlook: In the big picture, Baidu is a Chinese Google (NASDAQ:GOOG) in the making. To be sure, Google operates globally, while Baidu operates in just China. But, China comprises about 15% of global GDP, and the ratio of China GDP to global GDP, excluding China is about 17%. Thus, Baidu has runway to reasonably be about a fifth the size of Google at scale. Google currently has a market cap of $800 billion. Baidu’s market cap is below $60 billion. Thus, once investor sentiment improves, there’s ample runway for Baidu stock to head a lot higher. The Near-Term Outlook: When it comes to Alibaba (NYSE:BABA), you have a company that is the unparalleled leader in Chinese e-commerce and which is still growing revenues at a 40%-plus rate. You also have a stock that is more than 10% off recent highs, with a forward price-to-earnings multiple that is 15% off recent highs. But, consumer confidence is rebounding back to February 2018 levels. At that time, BABA stock had an all-time high valuation. Thus, as consumer confidence continues to improve throughout 2019, BABA stock will continue to rally thanks to multiple expansion. The Long-Term Outlook: In the big picture, Alibaba is a Chinese version of Amazon (NASDAQ:AMZN) that is growing more quickly in a still underdeveloped Chinese digital economy, and which has less competition. Also, Alibaba is just scratching the surface of its international growth potential, especially on the e-commerce front. All together, Alibaba projects to be a big grower for a lot longer. The rule of thumb with stocks is that, as go profits, so go stocks. This will prove to be true for Alibaba. Robust profit growth, in the long run, will power robust gains for BABA stock. The Near-Term Outlook: Shares of Tencent (OTCMKTS:TCEHY) were really beaten up in 2018 thanks to slowing economic growth and a video game approval freeze in China. Both of those headwinds are now reversing course. Economic growth is improving, and China is finally approving new video games. Yet, TCEHY stock remains 30% off recent highs. As such, there’s runway for this stock to keep heading higher as the fundamentals continue to improve throughout 2019. The Long-Term Outlook: In the big picture, Tencent has exposure to (and often dominance in) every meaningful sector of China’s digital economy, from digital advertising to gaming to payments, and everything in between. As stated earlier, China’s digital economy remains severely underdeveloped on a per capita basis, and as such, projects to broadly remain a big growth category for a lot longer. That means Tencent likewise projects as a big growth company for a lot longer, and TCEHY stock will rally alongside this big growth in the long run. The Near-Term Outlook: Shares of Chinese e-commerce giant JD.com (NYSE:JD) were hammered in 2018 on a plethora of headwinds, including slowing growth, falling margins, and bad optics. But, those headwinds are reversing course. Over the past several months, revenue growth has remained north of 20%, operating margins have improved meaningfully, and optics issues have been cleared up. JD stock remains more than 40% off 2018 highs. As such, so long as fourth-quarter margin improvements persist through 2019, JD stock has plenty of runway to keep rallying. The Long-Term Outlook: In the big picture, JD is a leading e-commerce player in China’s still rapidly growing and underdeveloped e-commerce market. The company also has tremendous potential to grow outside of China, too. As such, this company projects as a big grower for a lot longer. Margins are a recurring issue for this company. But, management has consistently said that margins will expand over time as growth-related investments peel back. That happened in the fourth quarter. So long as it continues to happen over the next several years, JD stock will head higher. The Near-Term Outlook: When an economy slows, travel in that economy tends to take a big hit. That’s exactly what happened in China throughout 2018, and it’s why shares of Chinese online travel site Ctrip (NASDAQ:CTRP) dropped nearly 60%. But, when an economy improves, travel in that economy tends to get a big boost, too. That’s where we are now. China’s economy is improving, and it’s only natural to assume that China travel will pick back up in 2019. As it does, Ctrip’s numbers will improve, and CTRP stock will rebound. The Long-Term Outlook: Chinese air travel has been and will remain one of the biggest secular growth narratives in the world, as a rapidly urbanizing and growing Chinese middle class are creating a surge in demand for business and leisure air travel. As this narrative continues to play out over the next several years, Ctrip will continue to grow, thanks to higher demand for online travel booking services. Revenues will rise. Profits will rise, too. So will CTRP stock. The Near-Term Outlook: Chinese social networking giant Momo (NASDAQ:MOMO) reported 50%-plus revenue growth last quarter and 20%-plus profit growth. To be sure, that implies that there are some margin troubles at Momo. But, even with those margin troubles, revenue growth is big enough to power 20%-plus profit growth. MOMO stock trades at an anemic 12 forward earnings. Ultimately, that multiple is too low for that level of growth, and positive Chinese economic and trade developments in 2019 will push MOMO stock way higher, as investors increasingly see MOMO stock as a cheap way to play the Chinese economic rebound. The Long-Term Outlook: Momo specializes on live video and online dating. Those are two aspects of China’s digital economy, which project to keep growing for a lot longer. This company won’t ever get that big given niche applications and use-cases for live video and online dating. But, it already has more than 100 million monthly active users, and that number is rapidly growing. As such, as China’s digital economy continues to evolve over the next several years, Momo should continue to grow its user base, revenues and profits. As that happens, MOMO stock will rise from its currently discounted valuation. The Near-Term Outlook: One Chinese stock that got the short end of the stick in the 2018 selloff was Weibo (NYSE:WB). The social networking platform saw its shares drop more than 60% during the back-half of 2018. Yet, during that stretch, Weibo continued to report robust user, revenue and profit growth. Thus, the selloff can be attributed mostly to trade, FX and macroeconomic headwinds. All of those headwinds are now reversing course, and Weibo is still reporting 40%-plus revenue and adjusted EBITDA growth. Thus, as those headwinds continue to reverse course in 2019, WB stock will continue to bounce back. The Long-Term Outlook: Many investors compare Weibo to Twitter (NYSE:TWTR). That’s a fair comparison, given the similarities in their respective platforms. The differences are that Weibo has more users and higher profit margins, while Twitter has more revenue. Twitter has a market cap $23 billion, versus a $16 billion market cap for Weibo. Thus, Weibo is being valued at a 30% discount to Twitter presumably because of lower revenues, but with more users in a roughly equivalent market, it’s only a matter of time before Weibo hits Twitter’s revenue levels. As such, Weibo is a big growth company trading at a big discount, and that is an attractive recipe for long-term success. As of this writing, Luke Lango was long BIDU, GOOG, AMZN, TCEHY, JD, CTRP, WB and TWTR. Article printed from InvestorPlace Media, https://investorplace.com/2019/03/chinese-stocks-to-buy-for-2019-rebound-fgim/.